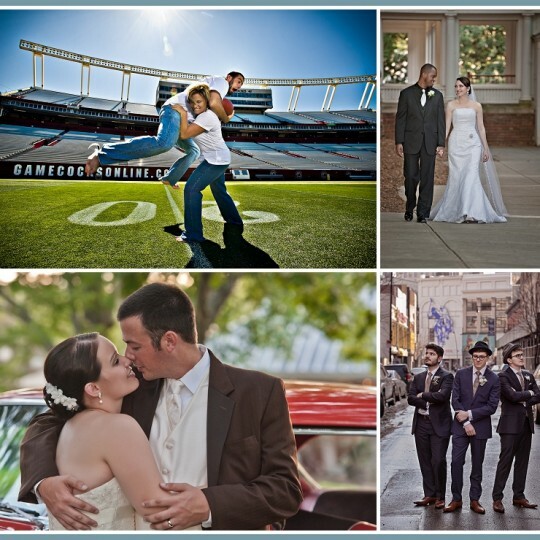 Jeff and Kamaria’s story began when they met at Wet Willies in Charlotte NC. Jeff stopped Kamaria as she was walking to the ladies room, and told her that she was the most beautiful person in the building that night. After a small conversation, they exchanged phone numbers. A few telephone conversations followed over a one month period and Jeff finally convinced Kamaria to go out on a date. They had sushi at the Red Bowl for lunch as their first date. Kamaria said that first date literally never ended. What was supposed to be just a lunch date led to a day at the park with Kamaria’s daughter, which led them to dinner, and then a night out with a group of Kamaria’s friends. 7 weeks after their first date, Jeff proposed! The proposal took place at the University Place Boardwalk. Kamaria said they were walking across the bridge and Jeff was being playful and silly as usual, when he suddenly dropped to one knee. The engagement lasted a short 13 months. Neither Kamaria or Jeff are from Charlotte, yet they met in Charlotte so they decided to have the wedding feature the feel of the city they met in. This would be their “destination wedding” since their families are from different states. Jeff and Kamaria wanted their out of town guests to experience the “Queen City” that they met and fell in love in. When the couple began to think of what a “dream wedding” meant to them, they could only imagine good food, good cocktails, good music, and tons of fun. With that in mind, an uptown wedding was a sure fit for Jeff & Kamaria. They visited several venues and easily agreed that the rooftop of the Holiday Inn would be a good fit and great experience for their friends and family. Jeff and Kamaria loved the idea of the venue because it allowed them to have an outdoor ceremony with the city skyline as their backdrop. The colors of the wedding weren’t really planned. Kamaria knew with their “city” theme, she wanted her brides maids to have “party” dresses. Kamaria found the platinum party dresses at a local department store and knew they would be perfect for their wedding theme. Kamaria said she felt the platinum color was elegant, classic and timeless so she said she had to go with it. Tiffany blue is a hot color this season and it looked great with the dresses. Kamaria figured it would be good as an accent color. Kamaria said that everything just seemed to come together after that. The venue was perfect for the ceremony and reception, the decor was a great match, the cake which was from “Wow Factor Cakes” was amazing, the food was delicious, the drinks, music, and everyone dancing the night away under the stars made their event the wedding of their dreams and was a Queen City night to remember. I want to give a special thanks to all of the following vendors who made Jeff & Kamaria’s dream wedding perfect: Rachel Kafsky at The Holiday Inn, Center City; John McKinstry, their minister; the Caterer Caffe Siena; Ann at Wow Factor Cakes; the Florist Tropical Images; the DJ of DJ Streets; and Monica Ramsey who provided hair and makeup. Here are some images from Jeff and Kamaria’s wedding day. They decided they wanted to do a “first look” before the wedding so they could use the City of Charlotte as our playground for some amazing images!